As you probably know IBM several month ago has released a new great tool named IBM Mail Onboarding Manager ( MOM for friends) that allow you to migrate on premise mail of your Domino environment to the IBM service server (IBM Connections cloud ) if you have hybrid configuration active on your corporate account. This tool still in 1.0 version but IBM have already released several version of this package with bug fix and feature update. The Search box supports typeahead to quickly filter the names of Users, Groups, or Settings for the current page. You can begin typing any place on the page to filter the list. Or type in the Search box and click the icon to view a sorted list of all items that contain the search string. Take the tour to preview this new feature. You can maximize the Settings sections for fuller view by clicking the Maximize icon or double clicking a section header. The Pre-transfer Instructions setting is now optional. You can specify whether or not to send an email, and if you do send one, you can specify when to send it. You can add a Notes client configuration button in the welcome email by selecting this option in the Post-provision Instructions setting. 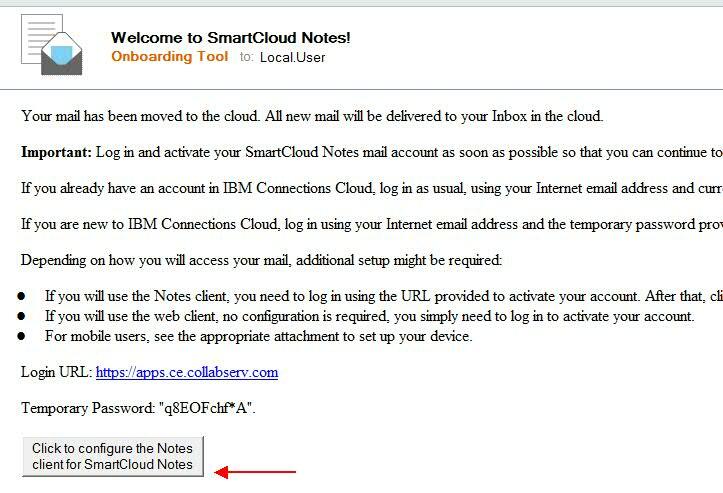 When a user clicks the button, the Notes client is automatically configured for SmartCloud Notes and a new SmartCloud Location document is created for the user. You can set Replication and Provisioning preferences. The Replica Location preference specifies the directory where local replicas are stored. Onboarding Activity preferences allow you to maximize server performance by letting you specify the number of onboarding tasks that are performed simultaneously. For more information see Setting preferences. Now we are finally able to make a transparent migration of the user that will receive only the onboard email with also a button (yay !!) for the final configuration insted the manual download from the site! Awesome , now i think most of my dreams about this tool are done!! For the best performance, install the Mail Onboarding Manager on a server that provides the greatest capacity. This is especially important if you will move large amounts of data. Disk Space: Approximately 1.5 times the total size of all user mail files. For example, to migrate 100 users with 5 GB mail per person, the total size of the mails is 500 GB. So the space required is 750 GB. Hi Matteo, how about migrating Outlook/Exchange users to IBM Connections Cloud? Is there already a solution for such a challenge? Hello, at this moment IBM has not released yet a tool who make a direct migration from exchange to IBM connections cloud (or at list is not a public tool).. If you need to do this migration you can use IMAP to copy the data to the IBM Cloud (there are a couple of tool that could make batch job and do that for all users) or you have to move the data to IBM Domino and then to The Cloud using MOM. 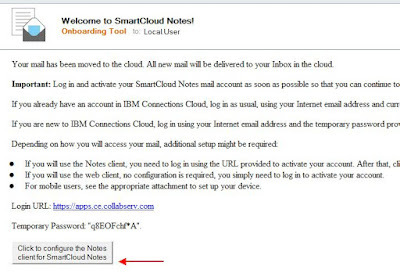 I hope IBM will release a MOM like tool for Echange and also for Google Apps mail. Thanks for the answer Matteo, would be great if IBM created a tool to migrate Exchange to Verse/Connections. We know about the imap route. Just to know if this MOM need the Pass thru server in DMZ to communicate with Smartcloud server?